Definitely. And if you want, you can use feedback from comments here in the thread to help you make your choices. I agree with Phil. I like the more zoomed-in version that you posted at the end. While your landscape was inspiring, pinups are not about the landscape. In fact, classic pinups have barely any backdrop at all. With so much focus on the figure, the figure has to be very good. This is the biggest reason why I find pinups to be not all that easy to do well. It's easy to plunk a figure in a scene, but getting that figure to sparkle is the challenge. Just curious, is the displacement turned off on the lava? Looks flat compared to mine. Thanks for the suggestions, UB. All on point, of course. I do the two versions of hair (dynamic and converted prop), along with the volumetric passes, to make it easier to correct, as per your suggestion. Will work more on other suggestions as well. The sporran (purse) was going to be falling off as per the woman's hat box in the Frahm original, but will give thought to your suggestion to use it to enhance the front of he kilt. All great suggestions, so keep them coming. Dart - Thanks for the comments. The hands are worse than you think! I did grab indvidual joints and rotate them. That result was user error, me. Misty - RE: commando, was going to have a second male figure with no boxers drooped, because the big mystery is supposed to be whether Scots wear them under the kilt. Just felt the scene wold be too busy. Also, please provide any constructive criticism that you may have for the B&W scotsman as well. Have been suggested to soften the background lines and darken the figures. Other suggestons? Thanks, Wendy. The drawers are from Sickleyield's men's underwear product. I can try to make them more frilly without having to render from scratch and see how it turns out. i heard a saying somewhere, on a good day wearing lipstick under the kilt ? Thank you, Bunyip. RE: devil in lava, would not have noticed if Dart had not pointed it out, but I like the new displacement better. Wendy and Misty - how about if I replace the boxers with a blue ribbon for 1st prize? Started working on my Halloween pin-up entry today and managed to get quite a bit done. The wall, floor and sarcophagus were modeled in Carrara. 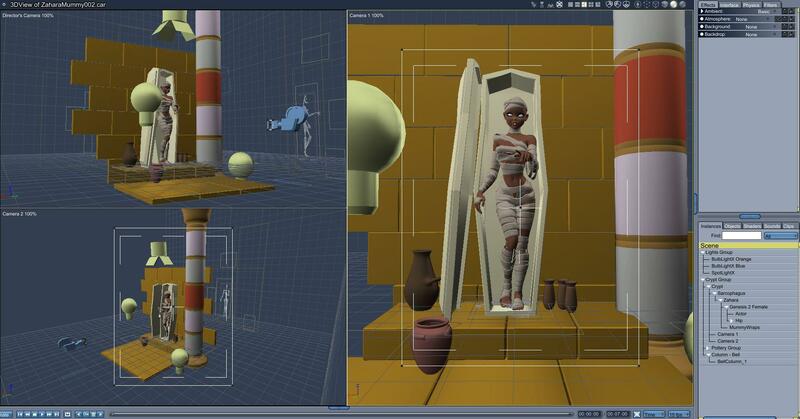 The mummy wrappings were modeled in Blender. Pottery and pillar are from some old content I found in my runtime. The textures on the wall, floor, sarcophagus and wrappings are just place-holders - I plan to use the 3D paint tool to paint those. I also need to play with the eye shaders to get some reflection in them. Or maybe they will be glowing, I haven't decided yet. This looks great already, I know you said you're still working on it, but hey this could be a pretty excellent entry just as it is. Great idea too. Great concept! Did you model the camera shutter circular opening thingie? This made me chuckle. Also I agree that the edit version is better. I stand corrected, the final edit really pops and looks even better, and I like the writing/heiroglyphs on the walls and floor, really sells the scene. Thanks Jon! Did you notice that the wall heiroglyphics are all pinup girls? Now I just need to come up with a title. It's between "Who's Your Mummy? and "That's One Poorly Wrapped Mummy!" HaHa! Nice touch with the heiroglyphics! All right, a classic pinup setting. Jon, superb skin!